If you missed seeing my demonstration at the St. Leon Food and Art Festival, you’re in luck. And here is the recipe I made. Hope you'll like it! 2. Place the dough on a stabilized cutting board. Using a serrated knife, cut kadaif dough into 2-inch pieces. Place in a large mixing bowl. With your hands, separate the dough strands, removing any clumps. 3. 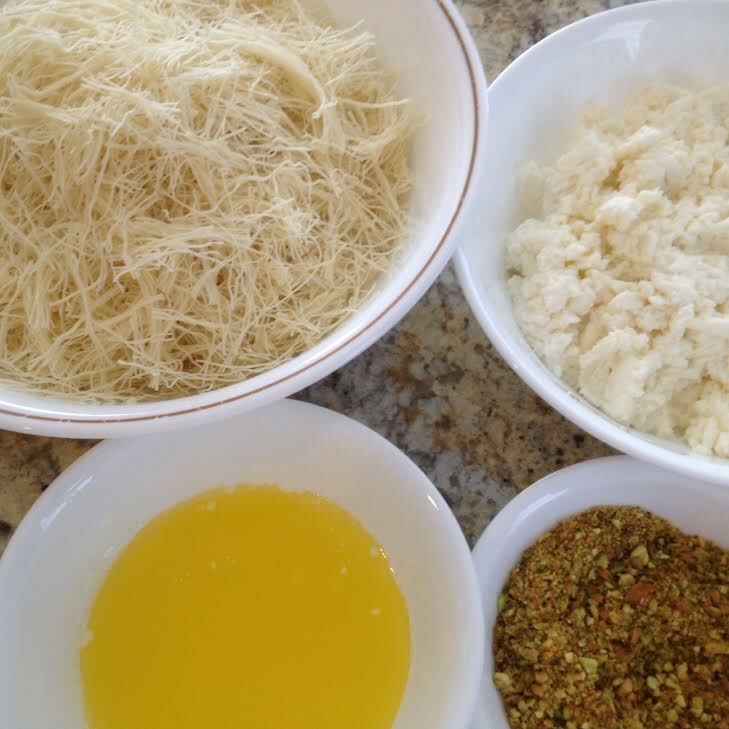 Drizzle the melted butter into the kadaif dough and, with your hands, gently massage the butter to coat the dough. 4. 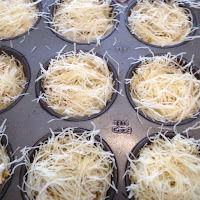 Using two 12-cup muffin tins, place some kadaif mixture on the bottom and up the sides of each cup, making sure the bottom has enough dough to support the filling. 5. Mix together the cheeses and cinnamon, if using. 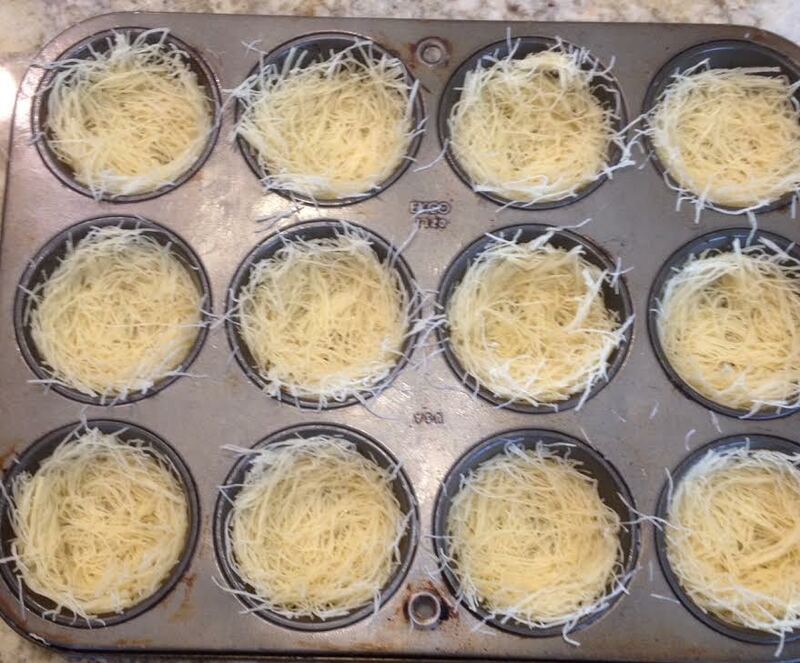 Place 1 or 2 tablespoons of the cheese mixture in each cup. 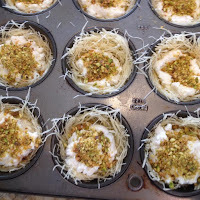 Sprinkle chopped pistachios on top of the cheese filling, if desired. 6. Bake for about 17 to 20 minutes, or until the dough is lightly golden. 7. 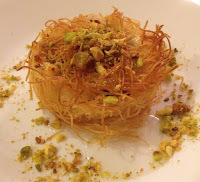 While the kadaif is baking, prepare the simple syrup. Make a simple syrup by bringing the sugar and water to a boil. Add lemon juice. Reduce heat to medium and cook, stirring occasionally, until sugar is dissolved and liquid reduces by a third, about 10 to 12 minutes. The syrup should coat the back of a spoon. 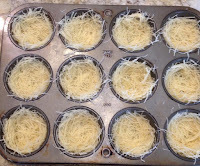 To Serve: As soon as the kadaif comes out of the oven, spoon some of the syrup over each while still in the muffin tin. Allow them to sit a few minutes to allow the syrup to soak through. 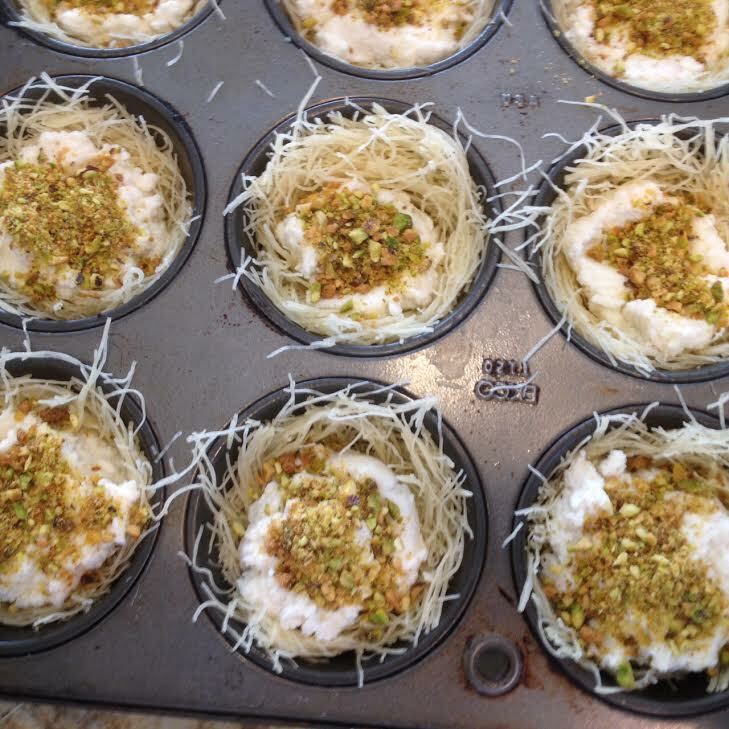 Use a spoon to loosen and remove each kadaif cup from the muffin tin. Place nests on individual serving dishes. Serve the remaining syrup to those with a sweet tooth. Best when served warm or hot. NOTE: Only pour syrup on those nests which will be served immediately. Any leftover cheese nests can be covered and refrigerated for a few days. When ready to serve, heat them in a preheated (350°F) oven or toaster oven for about 10 minutes. Melt about 1 lb. unsalted butter over low heat until foam appears on the surface. Skim foam and keep on low heat for about 15 minutes or until solids settle to bottom of pan. Cool about 15 to 20 minutes. Carefully pour clarified butter into container, leaving solids at bottom of the pan. Discard solids. Use the amount of clarified butter needed for the recipe. Cover and refrigerate remaining butter for another use. 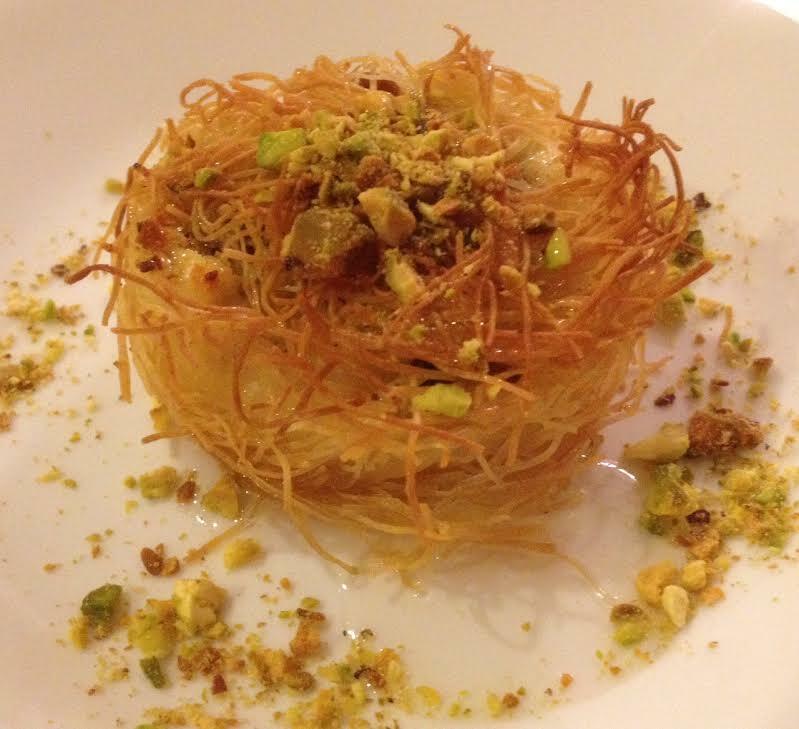 Your Kadayif Nests look delicious! Have you tried to freeze them? I was thinking to freeze them IN the muffin pans (before adding syrup), then pop out and store in an airtight container in the freezer. Thaw, heat, and then add the syrup. My only problem...Kadayif dough is nowhere to be found in my area. Do you have any mail order sources? I remember the St. Leon Food Fests from 50+ years ago - on a table set up in the Bergen Mall in Paramus!